Listen to the radio version of this story here. It originally aired in July, 2013. This story was originally posted in July. Shortly after, the Miami City Commission voted to allow efforts to save the stadium and designate the surrounding area a park. But the clock's ticking. 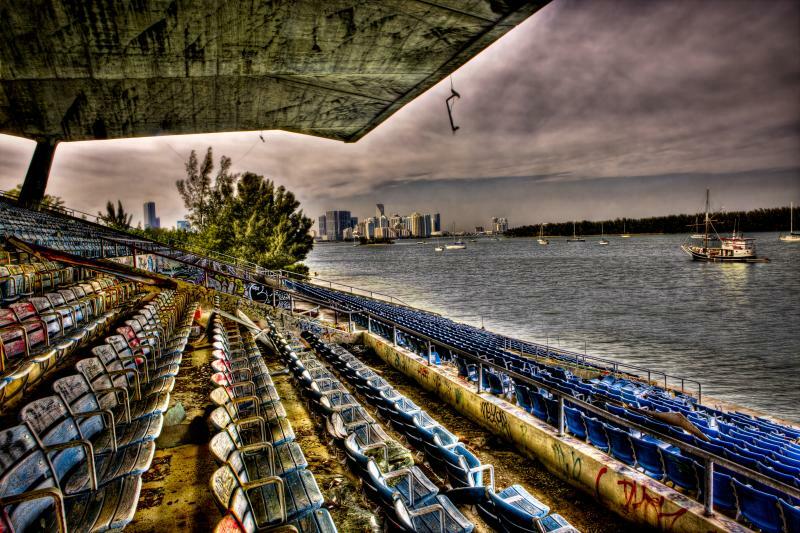 Friends of the Miami Marine Stadium, the group behind the effort, were given two years to raise $30 million dollars. Some big South Florida names who played the stadium during its glory days have gotten behind the move. Gloria Estefan and Jimmy Buffett are helping raise the money. Concrete Paradise, an exhibition at the Coral Gables Museum looking at the stadium through the years, is up through January 12th. Proceeds go towards saving the stadium. When Miami's Marine Stadium opened its doors in 1963, in many ways it represented in a new era for the city. Miami was rapidly changing faces after the first wave of Cuban immigrants found its way to Florida's shores, and Architect Hilario Candela was among the first of his generation of exiles to do something of such magnitude in the city; and he was only 28 years old upon its completion. The city was still young, stumbling on its own feet in an effort to transform into the worldwide city that it would one day become. The unorthodox design was derived straight from the shell vault architecture that Candela studied alongside mid-twentieth century masters in Havana and Georgia Tech. While the venue was built primarily for boat races, residents of the city soon began adopting it for their own uses that were not in the original program. 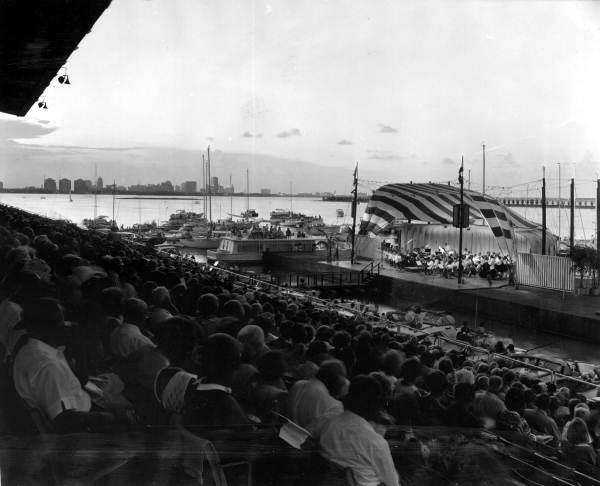 In addition to boat races, everything from concerts on floating stages, political rallies, Sunday prayers, weddings, and high school graduations took place on the premises at one time or another. "Thank God the community embraced it from the outset," says Candela. "The community felt right away that it was open, it was accessible. 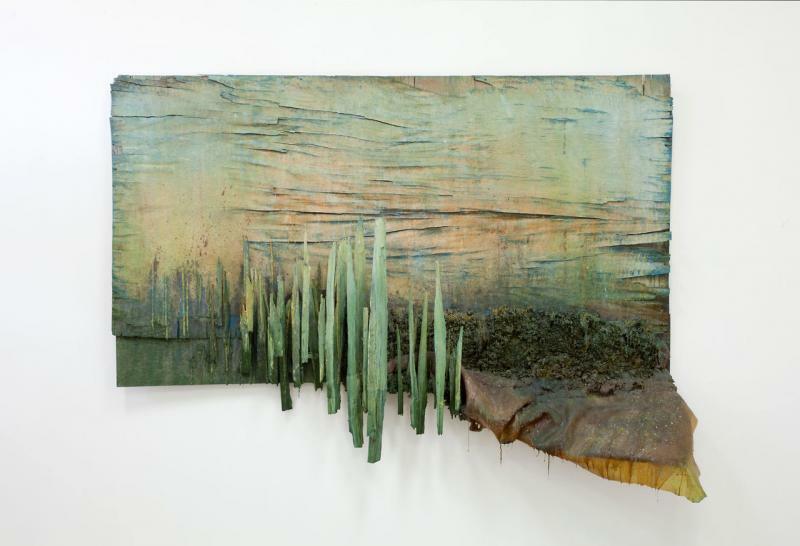 It was to celebrate the point where the water and the land come together." As far as scenery goes, there is scarcely a better view in the city. At sundown visitors could watch the sunset over the Miami skyline, which could be seen growing upwards in the distance over the years of its use. But for all the good use that the structure had, it still had its issues. Up until its closure after Hurricane Andrew in 1992 the site was run by the city of Miami, something that still ruffles feathers when brought up. Miami had been losing money with the venue for years, proof that the city was not adept at running a world class venue, according to Candela and others. Shortly after Hurricane Andrew ravaged South Florida in August of 1992, the city proclaimed that the structure was unsafe, and applied to FEMA for money, who gave them a million dollars to demolish it. But the stadium had insurance, and when inspections were completed they found the structure was actually intact. The city then returned the money, and decided to consider all options to move forward. Fast forward twenty one years, and the stadium still sits on the water, essentially abandoned. "These were acts of men who wanted to use the land for something else, and they decided maybe the stadium should come down," says Candela, rejecting the original notion that "acts of God" rendered the stadium unfit for use. Graffiti artist Quake and his MSG crew say that they were some of the first to transform the building from a relic of the past to the graffiti mecca that it became in the 1990's and 2000's. The structure itself was closed down, but the basin that it rested upon was still a popular boating attraction, bringing crowds into its view every day. Fellow artist then known as TV worked for a sailboard company, and he'd windsurf around that bay area, Quake says, crediting him as the one that launched it into its graffiti era. "He called me up one day and said, 'Hey man, you know I found this building. And it's abandoned. It's like a stadium on the water.' "
"There was blank walls, and it was a real funky building… There was a real nice breeze kicking in, and it was ideal place to paint, smoke, chill, climb up on the roof, stuff like that," he continues. Fellow painter and MSG member Crome chimes in on the conversation, "The architecture would just catch your eye with the pyramid rooftop and stuff. It was like almost made for graffiti, and the graffiti is just like the decoration that goes on the architectural piece of artwork. It's not like the average square building that we have most of the time." The ensuing era would see top graffiti artists from all around South Florida making the journey to the famed Marine Stadium for a chance to paint on its abstract-shaped walls. Skateboarders, photographers, and parkcour athletes (see video above) also frequented the site until a constant flow of trespassing arrests from the Miami Police Department rendered the spot invalid for practical reasons. Still, the legacy of the graffiti remains to this day. Countless movies, music videos, and TV shows have been shot at the site, taking advantage of the tropical scenery, contrasted with the beautiful abandon of the ground zero of a counterculture. Some might even say that it has helped raise the profile of the building as it prepares for what might be its next era. Not those to crater in to political inaction, an organization called Friends of the Marine Stadium formed in 2008 with the sole purpose of renovating and expanding the original vision of the stadium. 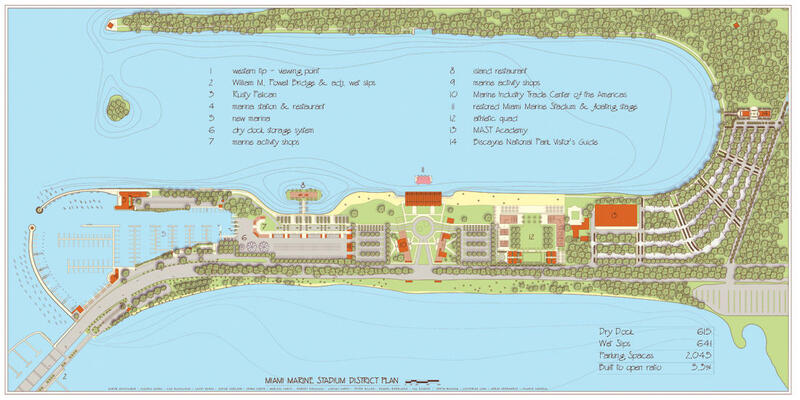 The approved master plan for Miami Marine Stadium and surrounding area, including a "flex park" and space for restaurants, etc.. Member Rosa Lowinger is an architecture conservator by trade, and she is also working to curate a gallery at the Coral Gables Museum documenting the history of the stadium-- graffiti included-- that will open this Fall. She says that the years of abandon have not all been a waste. "I think these twenty [one] years in a weird way were necessary for the stadium to go dormant, and be taken over by a population who was much cooler than who was running it before," she says. "It's been abandoned by the city, but it's not been abandoned by young people." Friends is embracing the idea of incorporating this legacy of street art into the master plan for the stadium, which was approved by the Miami City Commission in 2010. Only issue: this same commission has yet to designate Friends as the entity to move forward with the renovations, which is preventing the group from raising the $30 million that they say is needed. Helping build a national profile for the effort to pressure the city into action, the National Trust For Historic Preservation even named the structure as a National Treasure in 2012 after designating it as one of the 11 Most Endangered Historic Places in 2009. Singer Gloria Estefan also recently joined the renovation efforts with Friends. While the process has been stuck in a virtual limbo ever since 2010, that could be changing as early as this Thursday, July 11th. A steering committee of citizens appointed by the city manager has been looking at the case of renovating Marine Stadium since midyear 2012, and they have issued a unanimous recommendation that would allow the land surrounding the stadium to be turned into a park-- a crucial part of the master plan. On Thursday, the city manager will present the recommendation to the Miami City Commission to be either approved or disapproved. An approval would be one of the pivotal moments that advocates of the stadium have been waiting for, especially architect Candela, now in his 80s. "Five years ago I would kind of be romanticizing about the past, and not really thinking that we could get where we are today.. Every time that I think of the stadium, I think of the drawings and the sketches, and the images that were created about the future of the stadium. [About] its new life, which is obviously going to have a part of its old life." Florida’s natural world, like its social world, is of many minds: serene, clear, or bright one minute, then dark, indignant, or utterly furious the next. And sometimes it’s a quixotic mix. Anyone visiting the National Hotel on South Beach during Art Basel this week will get a rare peek inside the Miami Marine Stadium. 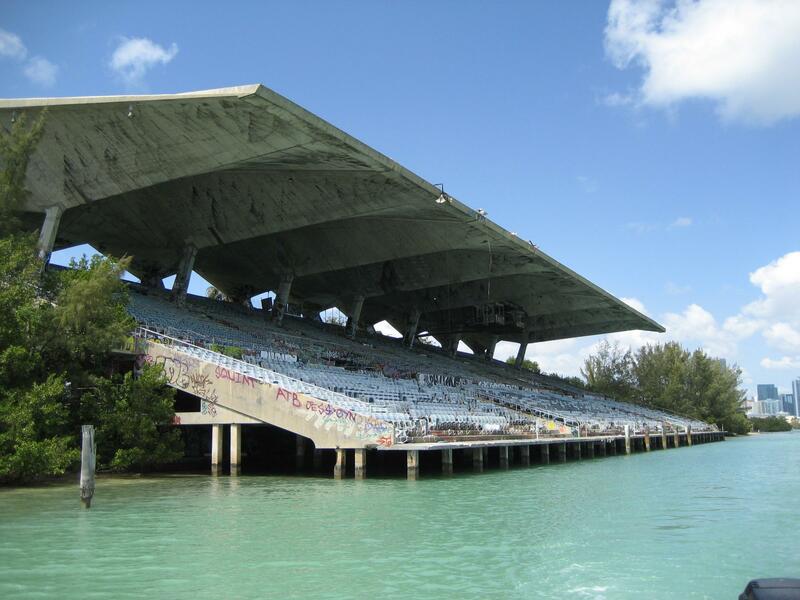 The Marine Stadium was built off the Miami mainland on Virginia Key in the 1960s. It was originally used for boat racing and then later for concerts and even religious services.